Margaritas are America’s favorite cocktail. 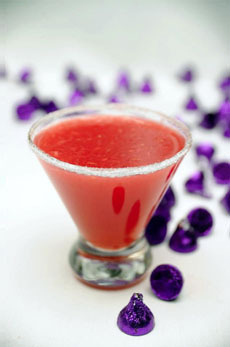 Tailor them for Valentine’s Day with a homemade Frozen Strawberry Margarita. 1. FILL a blender with ice and crush. Pour in the tequila and triple sec. Add the strawberries and limeade. 2. BLEND for 30 seconds or until smooth. Pour and serve. Who needs Champagne? Photo courtesy Haru Restaurant | NYC. Want something smaller? Here’s a recipe from Polar Seltzer. 1. MUDDLE the chopped strawberries and vodka in a cocktail shaker. Add ice and maraschino liqueur and shake. 2. STRAIN into a glass, filling half way and then add additional strawberries. Top with Polar Seltzer and whipped cream.